DOOM Survival Guide Episodes coming soon! Just another update on this. I've solved the technical issues I had while doing a recording with Vampire, Sniper, Swift, & Nero. I'm going to hold back on releasing that stuff though, so apologies to those involved. The reason is that I really want these videos to have a proper structure to them, with each episode having 'a point'. The stuff that I did with those guys so far was very funny, we just need to organise it a little better I think. Once DOOM 1 has been done, we'll do some game modes other than survival, then crack on with playing through DOOM2 ( not sure how I'm gonna divide that one up yet), Final DOOM, then we'll see where we are. 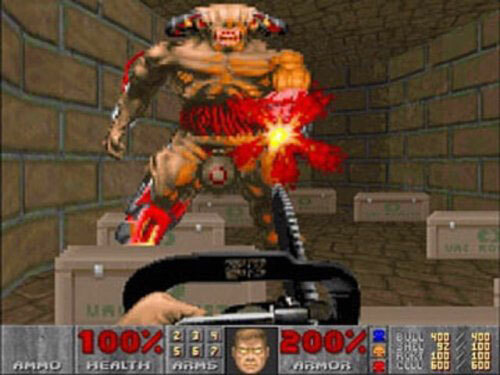 If you want to take part in the upcoming DOOM1 playthrough then you'll need a mic and I think a maximum of three players for each DOOM 1 episode is fair, otherwise we'd get through the levels too quickly. So spots may be tight, but if I can't fit everyone in, there'll be other vids. A big thanks to Krawa for providing a private server for recording these DOOM 1 eps!